The process for issuing refunds for purchases made through the OCU checkout is a two-step process. Refunds should be done in your connected payment processor account, and then in the Shopify Orders section (or vice versa, the order doesn't really matter). The refund issued in the payment processor account actually refunds the money back to the customer, but for now this information doesn't get passed to Shopify automatically. So you also need to go to your Shopify Orders section and make the refund there as well, to keep the record of the refund in Shopify and to restock any inventory if needed. The information gone over below is for Stripe, but the general information on how to work with OCU orders and Stripe's dashboard is basically the same for any of the supported credit card processors for OCU including: Braintree, Authorize.net and NMI. Note: OneClickUpsell will not work with your credit card processor in "Test" mode. Please ensure that you have your credit card processor account set to "Live"
When OCU creates an order, it will create separate transactions for the main order and each offer product purchased. This means when a customer purchases 1, 2 or 3 offer products, it will create 2, 3 or 4 Stripe transactions respectively, with the first transaction being the main order. All transactions generated by the same checkout session will have the same Checkout ID in the "Metadata" section, which will allow you to locate transactions from a specific order. That same "Checkout ID" will appear in the Order under the "Additional Details" section within the Shopify Orders section for your reference. The "Metadata" section in Stripe also allows you to see the name of the product and its type (upsell or downsell) if it is an offer product. The main order transaction does not contain information on product type. The process for issuing refunds for Orders process by OCU is a two-step process. Refunds should be done in your connected payment processor and then in your Shopify Orders section. 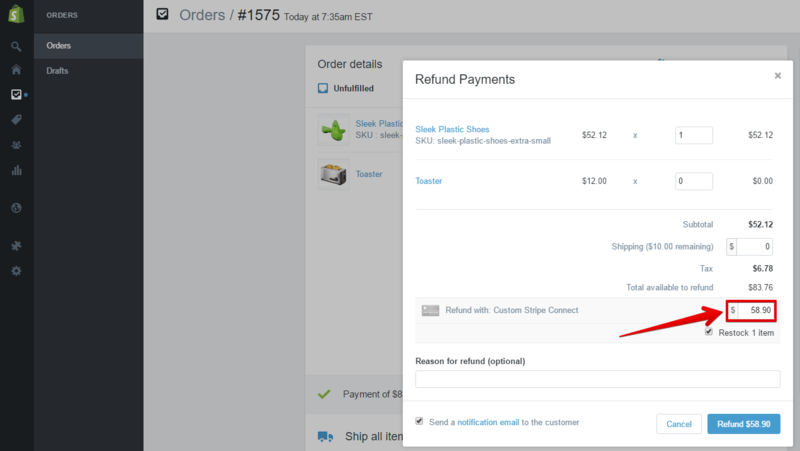 The refund issued in the payment processor panel actually refunds the money back to the customer, but this information doesn't get to Shopify automatically. So you also need to go to your Shopify Orders section and make the refund there as well, to keep the record of the refund in Shopify. *Note that the same steps/methods will apply to any of the supported payment processors, we're just using Stripe here as an example. First, make sure that the order was created via the OneClickUpsell app. This is easily determined by the "OneClickUpsell (via import)" badge in the top-right corner of the order details. Copy the "Checkout I.D." from the Shopify order you would like to issue a refund for. Login to your Stripe account and search for that "Checkout I.D." to show all transactions for that order in Stripe. Use the "Product" value from the "Metadata" section to ensure it's the correct product. Click into the needed transaction and press the "Refund" button. NOTE: The refund procedure above works similarly for all other payment processors. The OCU transaction amount includes not only the price of the product but also the tax and shipping charged for that specific product. The Shopify transaction on the other hand contains product cost(s) and the general amount of shipping cost and tax rate for the whole order. I.e. The transaction amount in Stripe is $58.90, but the transaction amount in Shopify for that exact same product is $52.12 (because Shopify is not including the tax rate and shipping cost for this specific product. So in Shopify, you need to specify the same amount that is shown in Stripe to ensure you are refunding the whole amount. OCU supports the Stripe Radar rules you set for your Stripe account. Through the "Stripe Connect" connection method for OCU, Radar support is already enabled and no action is required.